While many organizations have gotten onboard with latest technologies and adopted HR management systems, many others still manage key functions of human resources using traditional, messy and disconnected systems. HR management software has become an imperative asset in almost every corporate environment. It is a combination that connects human resource management and information technology. Almost every business is letting go of the idea that HRM systems are basically the costly and fancy additions that they do not require. HRM software streamlines workforce management processes and is thus able to make the most of your team’s potential. It is applicable in all business verticals to streamline recruitment, screening, hiring, and evaluation and works perfectly for talent finders and recruitment agencies that connect talented professionals with their future employers. Let's discuss some of the main advantages of using HR management software. Performance Management: This feature of HRM software captures the performance of the employees continuously and allows managers to get a complete picture of strengths and weaknesses of every single employee. Management can then accordingly use this information to provide training, regular feedback, annual audit and appraisals. This sort of annual audit can be very valuable with regards to succession planning and overall productivity improvement. Electronic Employee Database: Storing data electronically can enhance productivity in recording and finding data. This can be an advantage for organizations in which data is lost or misplaced, or where extensive file cabinets are required to store the data of a vast workforce. Notwithstanding having the capacity to store the data in less space and find required information in seconds, electronic information can likewise be investigated for strategic purposes and better secured against breaches. Recruiting Systems: HR frameworks can spare organization's gigantic measures of time and can guarantee that the best candidates are hired. By taking advantage of a bigger candidate pool and enabling best talent to apply effectively, HR frameworks can help to quickly raise hiring benchmarks. Associating hiring systems to the employee database can make it easy to convert application data into an employee file once hiring is done. Automated Payroll System: Having an electronic payroll system can spare an organization the inconvenience of outsourcing payroll needs and give the organization more control over payroll data. Obviously, it bodes well to link in-house payroll features specifically to employee information, time and attendance tracking software. This can diminish the risk of calculation errors significantly. Error Reduction: Numerous HR activities are profoundly regulated, and even a minor blunder by an HR employee could bring about extensive legitimate issues and even financial losses for the organization. An HRM framework can give direction to stay away from these kinds of issues before they raise. 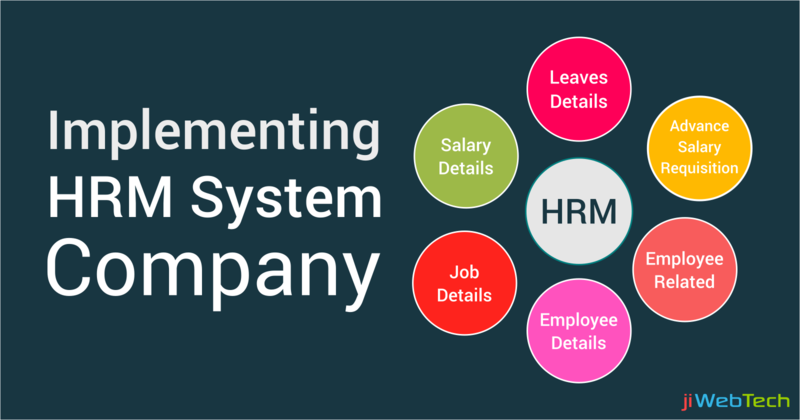 So in case, you're burnt out on being held to a higher standard while not getting similar awards and consideration that different departments get, this is the ideal opportunity to make a move as above mentioned are some of the great benefits of utilizing HRM system in your organization. However, implementing HRM programs is not simple. It is imperative to know how to do it impeccably.